As covered in the Fulton County Daily Report, ELS Partner Jamala McFadden moderated a discussion between retired Court of Appeals Judge Herb Phipps and historian Maurice Daniels providing a historical legal perspective on the lives and legacies of Georgia civil rights lawyers, particularly Donald Hollowell and C.B. King. 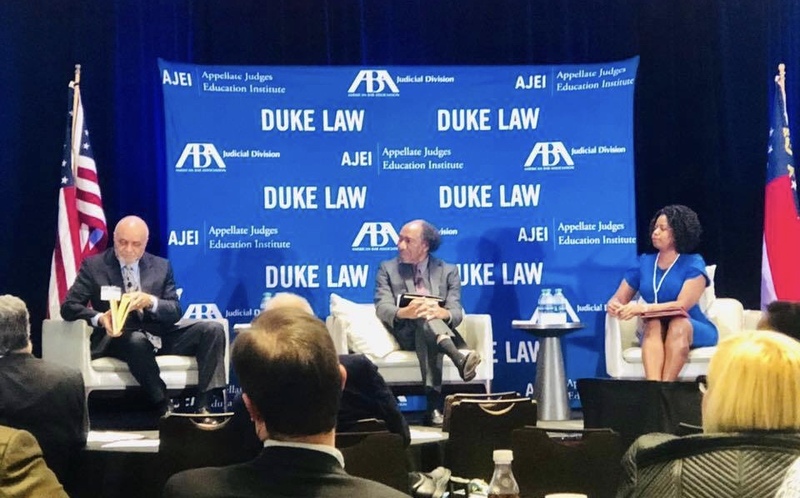 The discussion was the opening session of the Appellate Judges Education Institute (AJEI) 2018 Summit. AJEI teamed with the Eleventh Circuit Appellate Practice Institute (ECAPI) to host the joint AJEI and ECAPI Summit. The Summit included more than 300 appellate judges, staff attorneys and lawyers of AJEI together with the 200 lawyers and judges of ECAPI.